Platinum Tool de México provides high quality mold builds, mold repairs, maintenance and engineering changes for molds and tooling. Our extensive experience in a variety of tooling applications includes automotive, consumer products and aerospace. 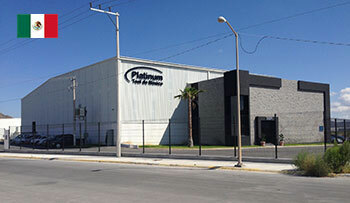 Located in Ramos Arizpe in the state of Coahuila, México, our 20,000 square foot facility offers a wide array of technology and equipment to provide CNC machining, EDM, milling, grinding, fitting, drilling, spotting, welding and has a lifting capacity up to 44 tons. Specialized Core team staffed with highly skilled Canadian employees with expertise in mold engineering, manufacturing, machining, and polishing. Tool and part design, surfacing and feasibility provided by Platinum Tool Technologies Canadian operations with vast experience, skills, and resources. If you require high quality repairs, maintenance and engineering changes for your molds and tooling contact us. We have extensive experience in a variety of tooling applications includes the automotive, medical, appliances, electronics and aerospace industries.